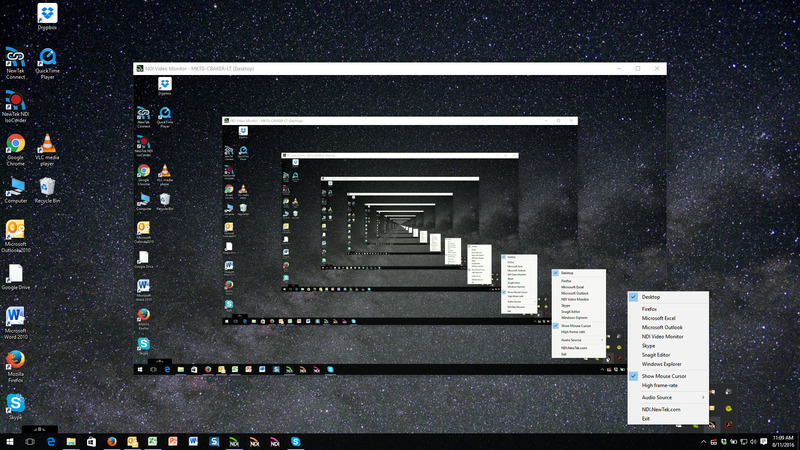 In our modern digital lives, we have an endless number of ways we use our computers, including using them to produce video. 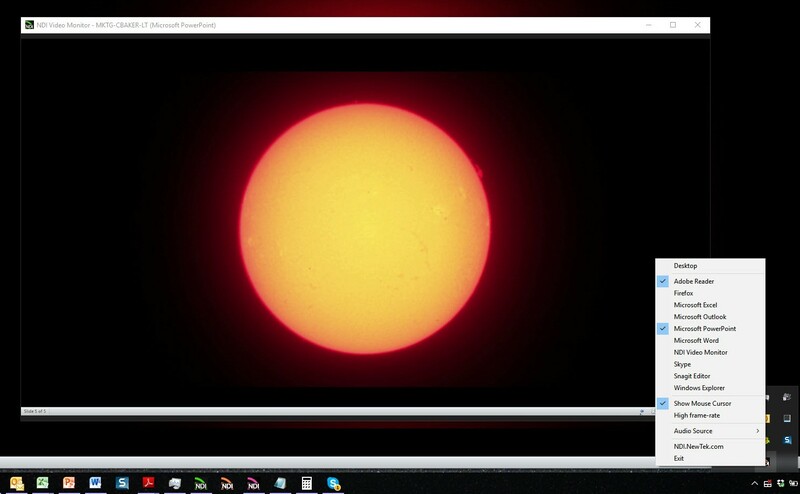 We may want to send full-screen output as video to a switcher or recorder to make training or demonstration videos. We may want to send just the output of one program as a video source like a dedicated text or graphics program specifically for broadcast production, or it could be a program used daily for common business or personal tasks. Many broadcast production applications have adopted NewTek’s Network Device Interface (NDI) and are able to send their output to the network where any NDI-enabled production system can receive it. Products and applications that don’t yet include IP workflows can do so by using NewTek NDI Scan Converter, one of the applications in the free NewTek NDI Tools Pack. 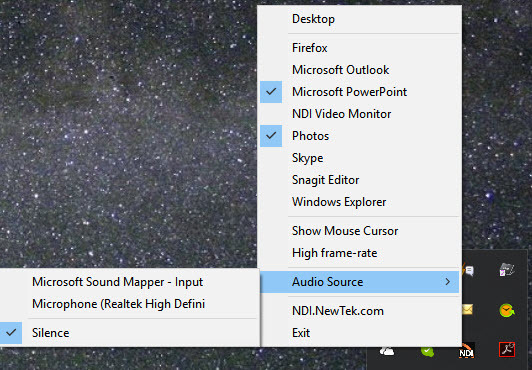 Locate NewTek NDI Tools, and click the arrow to drop down the list. Select NDI Scan Converter from the list of applications. 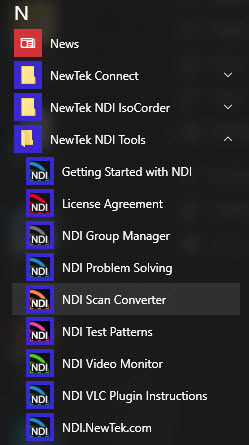 This will open NDI Scan Converter in your Windows application tray. 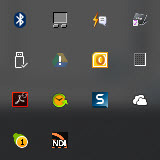 When you wish to use it to activate or change video output to the network from the system, open the application tray and right-click on the NDI button to bring up the context menu. 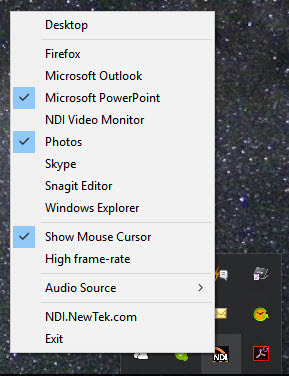 At the top of the context menu is Desktop, which will let you send the full-screen display from your system as NDI video to the network. 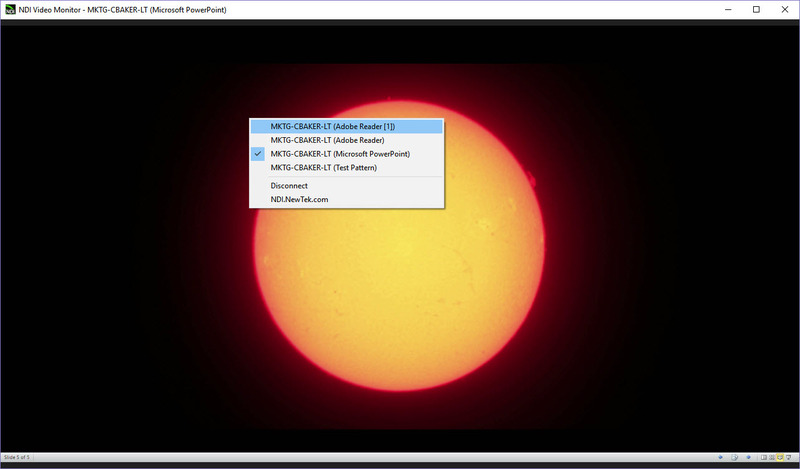 Below this, the context menu lists the open applications on your system, so that you can choose to output one of them as a video source. You can select more than one of the available options, and all will be streamed as NDI sources to the network. You can also select the system audio device that you prefer to send audio from with the NDI stream, or send no audio (silence). High frame-rate will send a true 60 frames-per-second progressive video stream. Gamers may prefer to use this option for live productions of esports competitions. 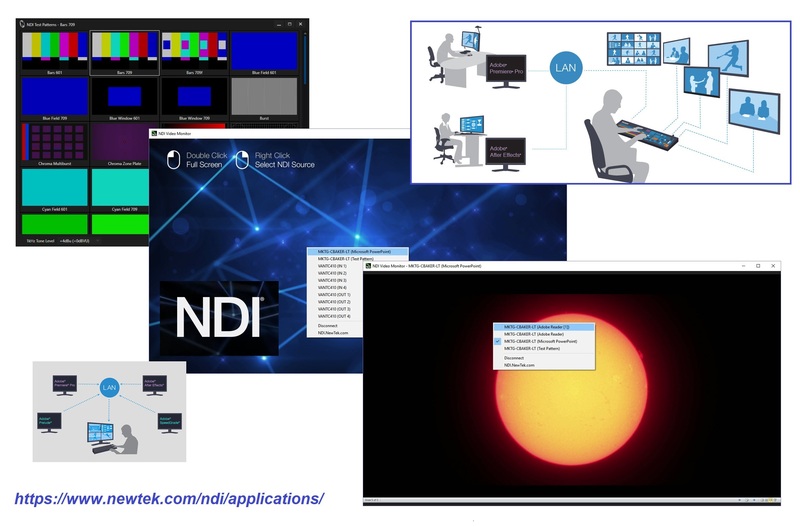 Once you have selected your Desktop and/or one or more applications for output, you can go to your NDI-enabled production systems (TriCaster and production switchers from other manufacturers) and you will find that your NDI streams are now visible and can be used by the production systems. 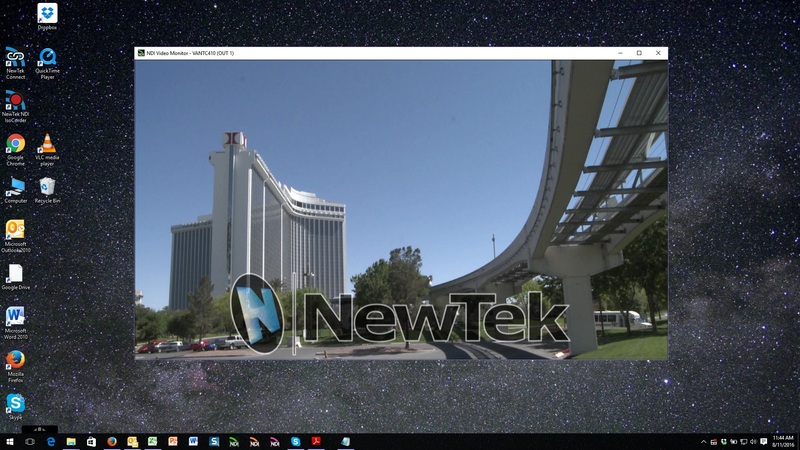 You can also view your streams on any networked PCs running NewTek NDI Video Monitor, another of the applications in the free NewTek NDI Tools Pack. 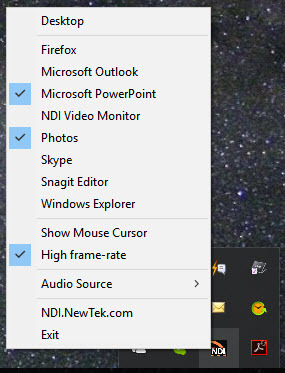 At right, we see the context menu open in NDI Video Monitor’s window, with several sources available to choose from. NewTek’s years of experience in IP video transport engineering makes the process so efficient that a standard PC can host multiple streams with minimal impact, allowing the user to continue with other tasks with no noticeable effect on performance. So, we wondered (and so did you!) what would happen if we ran both NDI Scan Converter and NDI Video Monitor on the same system and published the Desktop...this is it!